I cannot take an ounce of credit for today's little tip--my son's preschool teacher taught it to me years ago. It's such a good one, I couldn't keep it to myself. 3. While the child is still pinching the Kleenex in those two fingers, tell him to hold the pencil in the remaining three fingers. 4. Remarkably, as long as the Kleenex is still "occupying" their 4th and 5th fingers, the child will naturally hold the pencil the right way. If you have a tip you'd like to share with Bloggityville, just leave your link below. WFMW guidelines can be found here. Please, please, PRETTY PLEASE, link directly to your WFMW post and not to the front page of your blog. Here's how you do that. Oh, and while I have your attention, hopefully you're planning to play along in the Dog Days of Summer Bloggy Giveaway--you can see the details here. The contests all go "live" next week, so you still have several days to come up with a fun drawing to hold at your blog. Join the party! 42. Mommy Zabs- I Heart Label Makers! 144. Jodi - HHQ - Vinegar for ants! Man, I wish I'd heard this tip when my little ones were littler! My youngest was the hardest one--she always did the "fist" method. Thanks for a great tip. Great tip! I have struggled with this very thing. That is a great tip! I have problems because I can't do the steps here. And I've never hed my pencil the "right" way. I think I could've used this tip when I was in kindergarten! I will definitely use it when I help my son! I'm going to have to try that one. Thank you so much for this post! I was having a really hard time showing my 4 year old how to properly hold a pencil. I will definitely try it this way. Also, I made a mistake and linked twice to WFMW. Sorry! 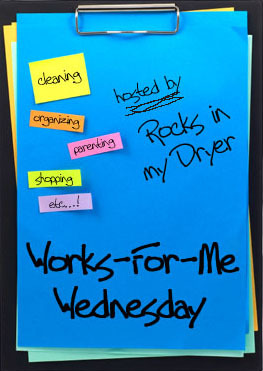 Check out my blog to see your Rockin' Girl Blogger Nomination! That's a great idea. My guys are older, but I will keep this in mind for when the grandkids come along. Oops -- I forgot to put my synopsis in parentheses behind my name in "Mr. Linky." It used say "delete link?" behind my name but I don't see it -- if you want to delete #25, that's fine. I added it again on #28 with the subject. Thanks for the timely tip. I'm going to do this with my 4 year old tomorrow. I'm going to see if this keeps my daughter from holding the pencil with both fingers instead of resting it on her middle one. That's a great tip! Another one I learned from my daughter's occupational therapist is to have them write with a short crayon or pencil. 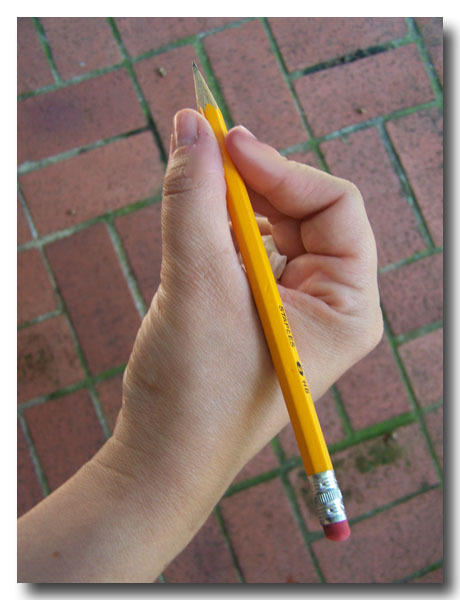 If there's not enough pencil for all their fingers to fit around, they'll hold the pencil correctly. I have to wonder why the great teachers at my kids' school haven't used this? It seems so terrific, so perfect and after all the trouble they go to teach proper pencil holding you'd think they'd be all over this. Great tip. Thanks for that tip! We will be trying it TODAY! That's a great tip Shannon - My number 2 is just at this stage now so thanks a million. What if they need to blow their nose?? Great - we will try this today. Thanks. I am another one that did not add my description. I must be out of practice. So sorry...and there is no delete link or edit function. Sorry! New blogger here. Forgot to put in my description too! Oh well, theres always again. That is a fab tip, Shannon! My son is nearly 6 and still holds his pencil fist-like! 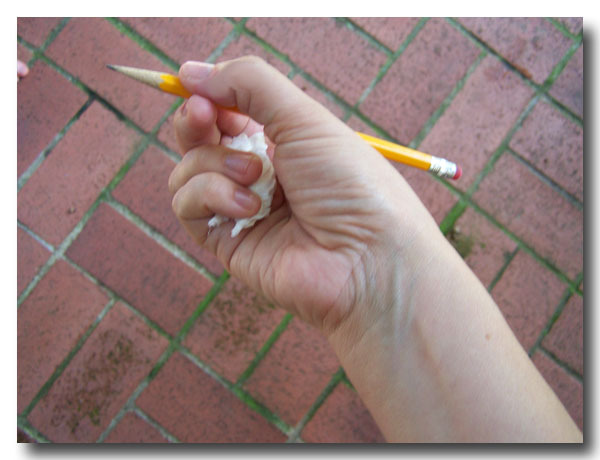 I'm a righty trying to teach a lefty how to hold a pencil! This is GREAT information! Thanks a bunch! That's a great idea! With one entering K5 it will be really helpful!! Great tip! I'm going to teach this to my son's preschool teacher. They'll have a much easier time with those pincher grasps then! Thanks for hosting! Fabulous idea! Wish I'd had that when I was teaching in my classroom or when I taught my own kids! I'll be passing that on! Considering I hold my pencil on my ring finger (and I have a callous to prove it) I obviously was not taught correctly! Thanks for the tip...I'll post it in my mom brain for those days of teaching writing! Thanks for the tip! This is a tricky skill to teach kids- I'll remember to try this! thanks for the tip! love the new green color too! Oh good grief - could you (and that teacher) be ANY smarter!? *wink* What a cool idea! oops, you can delete my post as Johanna...I added my shop & can't delete it?? I can't wait to try this! I am a first grade teacher, and I have never heard this idea. There seems to always be 1 or 2 children who can't "get it" no matter what I try with them. Thanks for the tip! This is the best idea ever! I have a little one starting kindergarten this fall, so this will help a ton! Like so many others, I've got a 5-yr old starting K this fall, too, who also hasn't grasped the correct way to hold a pen or pencil yet. Her 2-yr old sister is a natural, but we've tried over and over to teach the older one. I'm definitely going to give this a try today. Thanks for the great tip! I love this idea - I am going to try it today with my 5yo son! Thanks so much for sharing! Great idea, friend. Just a couple years too late for us. I actually participated today. Drop by if you get a chance! I like this tip! Will be using it with my 5 yo! Great tip! I'll have to remember that one in a few years. I will pass on your tip to those with little ones! Great tip! Sorry I messed up the first time. I think the link will work now. What a great tip!!! My oldest is four and a lefty. I'll be sure to use this idea. Great tip! I have 2 kids that are at the age for this one. I'm participating for the first time today - thanks for hosting! Great trick!! I will use this today! I've tried to show my daughter how to hold the pencil properly with no success. Great idea! loved the pencil tip! will try it today! Great tip! Thanks for another great week! Oh,boy! I am a Pre-K teacher and even though I work on skills to strenghthen fine motor skills some of my students will be ready for this. The kindgergarten teachers will love it. Thanks for the great tip!!! I will get it right next time. I put my subject by my direct link so that made it invalid. My first login was to my main page, sorry. Never heard of, or thought of that! I'm going to try that with my 2yr old! That is an AWESOME tip! I can't wait to try it with my sons. I am gonna have to try this. what a great idea! Thanks for the pictures, too - this is very useful in our hosue right now. I will DEFINITELY try this out with my 3 year old who is just experimenting with writing now! What a cool trick, I could have used that when my 5th grader was in kindergarten! I had issues while pregnant so she was born with week muscles. We thought she outgrew it around 2.5 until she went to kindergarten. Then all that fine motor skills really showed her weakness. Great tip! Great tip! I am going to try this with my two youngest. My oldest's preschool teachers finally gave up on trying to get him to hold his pencil the right way and said the kindergarten teacher could teach him. I think I'll give this tip to those preschool teachers, since my daughter will be going there this year. Fantastic Idea! I'll Pass that one on at occupational therapy. It will help a lot of children! That is so cool! Thanks for posting that! Thank you for this tip and in case you didn't hear it: THANK YOU!! That is a great hint, Shannon! WOW! Great idea! My 4yo has intermittent amnesia with acceptable pencil holding; this would DEFINITELY help on those days when he's feeling less "recollective" (and I would feel less likely to need ibuprofen trying to help him). Shannon, did you do something differently this time? I've never gotten an actual HTML link before this WFMW. Whatever you did, THANK YOU! Now, that is seriously wonderful. I called some Pre-K and 1st Grade teacher friends and they were so excited. 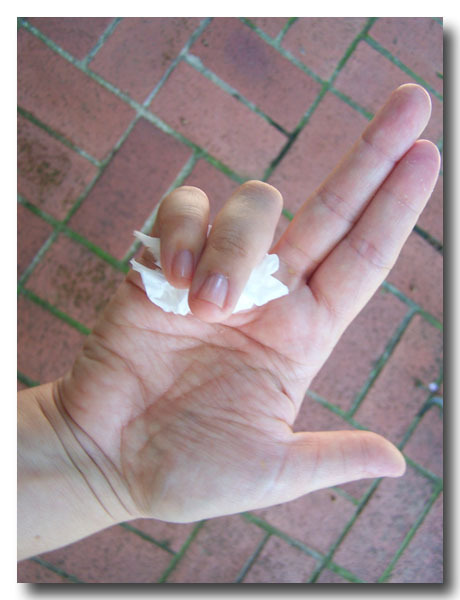 They have discovered that when the kids hold the Kleenex with the pinkie, middle, and ring finger,the pencil is easier to manipulate and transfers to holding eating utensils. This method works with either method. Many, many thanks to the teacher who developed this! I use two cotton balls instead of a torn kleenex, but the same basic principle. It was taught to me by our school's occupational therapist a couple of years ago and now I use it with any of my kinder-students who are struggling. Not sure if I can still get in or not, but here is the link anyway...http://harmonyhillmusic.blogspot.com/2007/07/bloggie-giveaway.html. Not sure if I did that right -- Me and Mr. Linky are still getting acquainted...Thanks for the great idea! Oh Bother...Now I realized I commented on the wrong post...Can I blame it on menopause??? I need to link to this on my blog. This really works! I was a second grade teacher for three years and could have used this tip back then:). Thanks!